I’ve been reading a wonderful book that I checked out from our guild library, Quilts from Europe by Gul Laporte. (I may have to purchase this book from Amazon very soon.) 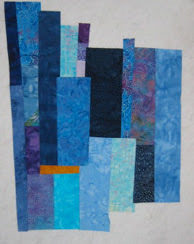 There are so many wonderful art quilts in the book as well as challenging projects. The project I’ve been working on is by Heide Stoll-Weber. Here is what I was able to complete on Sunday afternoon. I must say the Y seams were tricky but I got them done. I’m going to call it “sunset”. hopefully, I’ll be able to complete the pillowcase backing and quilting this week. I have that book too and just love it. So inspiring.